There are over 5000 hotels bookable online in London which means there are lots of good deals out there! In fact, some hotels are London landmarks in themselves, the Ritz, the Savoy or the Dorchester for example. 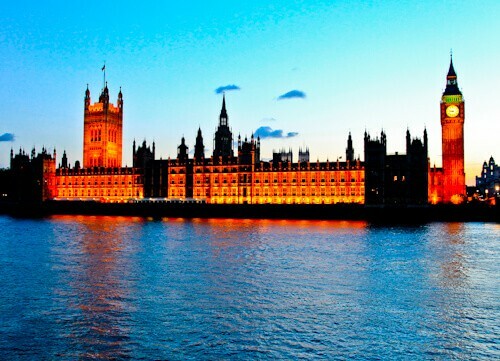 Top of most peoples lists of things to see in London are the Houses of Parliament and Big Ben. You can take a tour of the Houses of Parliament, it’s recommended to book in advance and check available times. I was more interested in photographing the Houses of Parliament and Big Ben than going inside, there are so many different viewpoints to shoot from, if it’s been raining you can use a puddle to make some reflection photography of the buildings. Furthermore, they’re a UNESCO world heritage site. 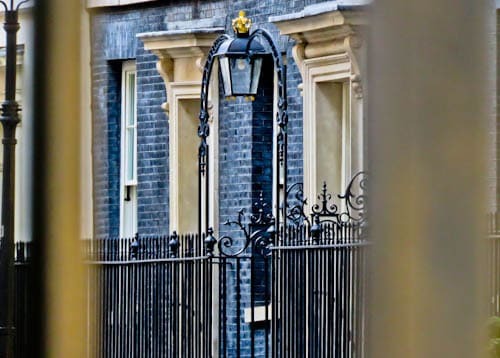 A short walk from the Houses of Parliament is 10 Downing Street, the residence of the current Prime Minister of the UK. As you would expect, for security reasons it’s not possible to take selfies by the iconic black door. However, you can see the entrance, look out for the gate with a gold crown above it. 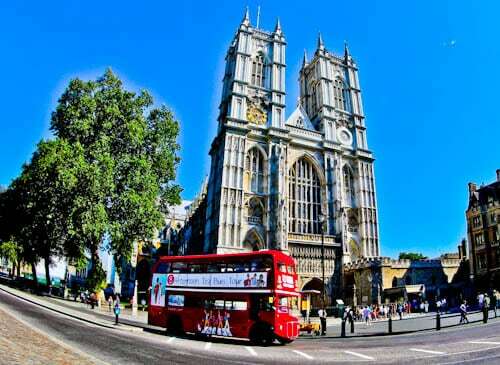 Westminster Abbey is a Gothic church and UNESCO world heritage site famous for many important events in British history. It is the final resting place of 17 British monarchs. There have been many royal coronations, weddings and funerals at Westminster Abbey. For those interested in the British Royal family a visit to Westminster Abbey is a must. It is free to go inside the abbey and an interesting tomb you’ll come across inside is the tomb of the unknown warrior. This is the tomb of an unknown soldier killed in Europe during World War I but represents all unknown British soldiers killed during this war. 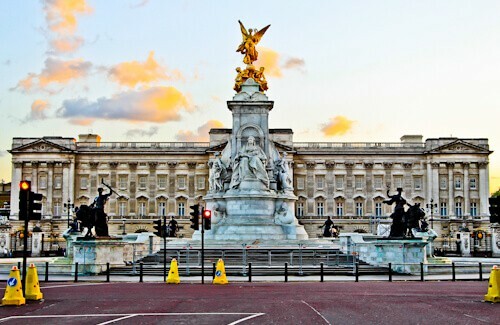 The Queen of England lives in London, her residence is Buckingham Palace. You may have seen on TV lot’s of people waving British flags whilst the Queen travels past. Usually she is driving down the Mall towards Buckingham Palace. 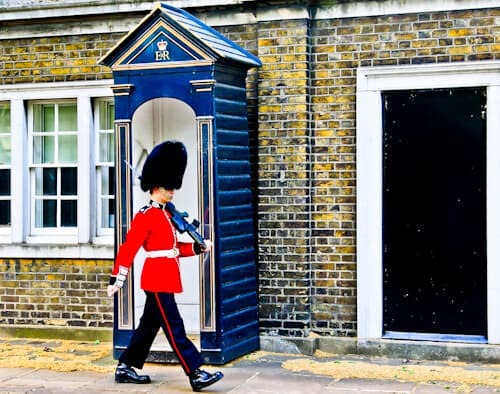 As you walk down the mall you’ll probably pass some of the Queen’s guards with the tall black hats and red coats. You can check out the changing of the guard schedule and plan your visit to Buckingham Palace at the best time. The guards do not smile, just like in the famous Mr Bean sketch but feel free to have your photo taken with one. 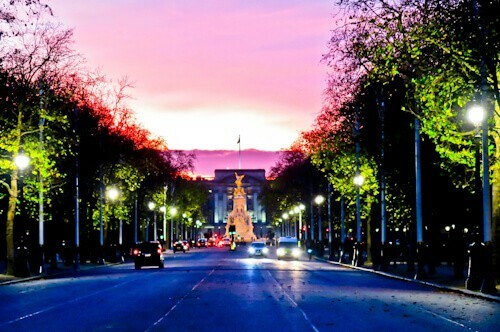 Buckingham Palace is the home of the Queen of England therefore an important London landmark. You can visit the palace exterior 24 hours a day. Personally I preferred Buckingham Palace at sunset when it was quieter. If you’re extremely lucky, the Queen will come out onto the balcony and wave at you! Opposite the Houses of Parliament is the London Eye which is perfect for a birds eye view of the city. The London Eye is very popular and quite expensive, I would recommend booking in advance if you have a strong desire to use this attraction. An iconic London landmark is Tower Bridge. There’s a tour of Tower Bridge on which you can ascend the famous towers and walk on a glass floor over the road below. There are so many angles from which you can photograph the bridge. How about at night with trail lights from the boats beneath it? A popular photograph is with the Shard in the background. Be imaginative, this landmark is can be photographed a million beautiful ways. 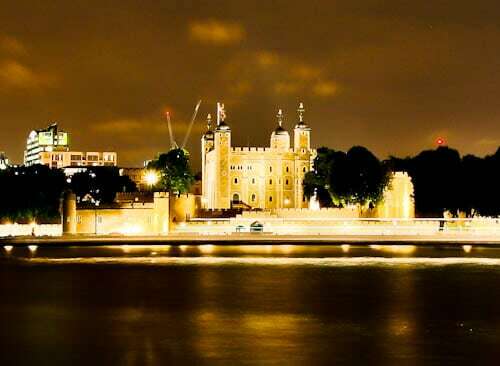 A short walk from Tower Bridge is the Tower of London where you can see the Crown Jewels. The Crown Jewels are a wanted item and have been attempted to be stolen by many famous characters from the Muppets to the Minions. Interesting things to do in the Tower of London are take photos of the Beefeater guards as well as the fortress. In addition, the Tower of London is a UNESCO site. No trip to London is complete without a visit to Piccadilly Circus. It’s also a famous meeting point and you see many locals waiting to meet up here. 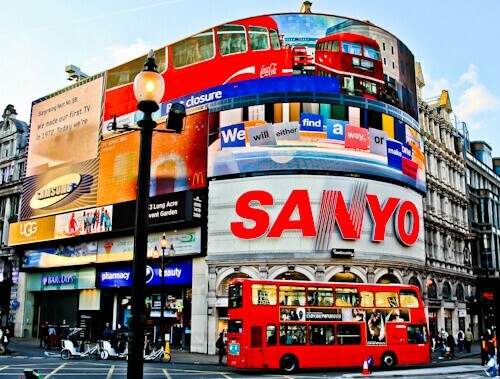 Circus is the latin world for circle, which is the shape of Piccadilly, unfortunately there is no circus here! It’s famous for the neon sign, as a result it’s an excellent Instagram spot. How about waiting for a red London bus to pass to enhance the photo. Trafalgar Square is one of the most popular London landmarks. 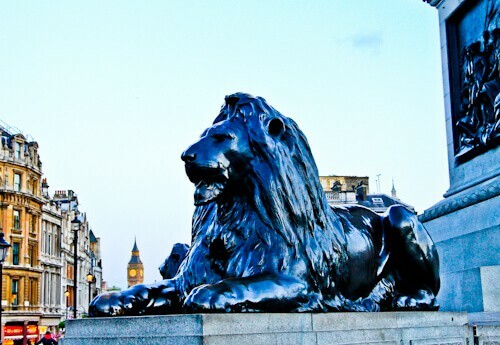 Most people take a photo with one of the famous lions of Trafalgar Square and you’ll probably have to get in line if you want your photo with a lion. You are free to jump up and sit with the lion for your photo. Scotland Yard is located close to Trafalgar Square. 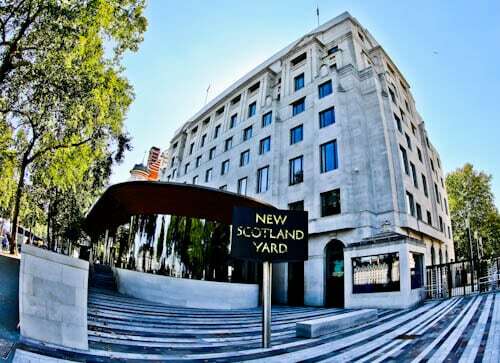 You’ve probably seen Scotland Yard in a James Bond movie, it’s the headquarters of the Metropolitan Police Service. The Shard is the tallest building in the UK and Western Europe. It’s an excellent option for a birds eye view of the city. You can book online your trip to the top of The Shard. In addition, there’s a Shangri La hotel in the Shard if you want bragging rights to having stayed in the tallest building in the UK. 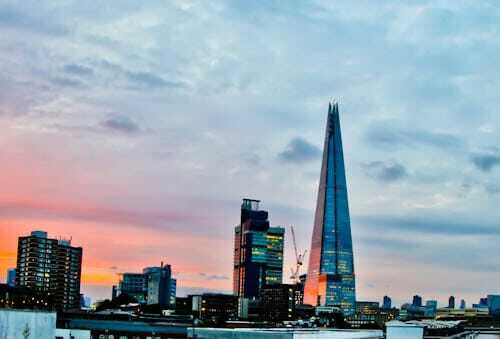 I stayed in South Point Suites which offers 24 hour views of the Shard, especially beautiful at sunset. 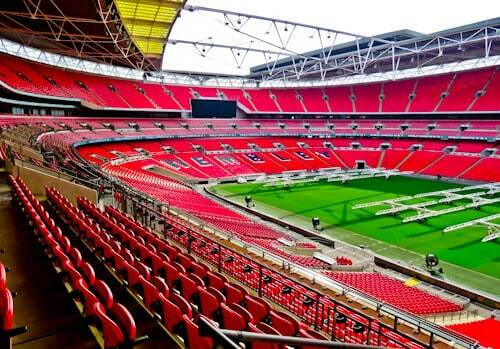 Wembley Stadium is the home of the England football team. Additionally, it’s the largest stadium in the UK and second largest in Europe after Barcelona. The FA Cup final is held here, as well as England home games. Concert are also held here, the biggest music stars have performed here including Queen, Michael Jackson, Adele and Ed Sheeran. For football and music fans alike, a visit to this iconic stadium is a must. 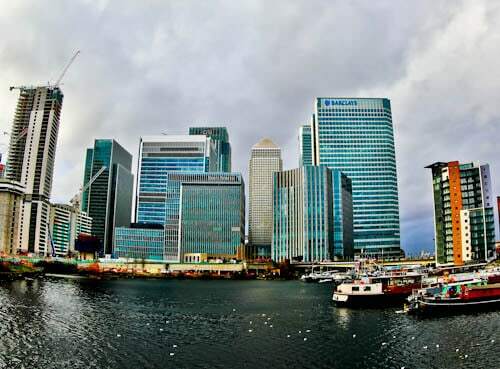 Canary Wharf is a financial district of London located on the Isle of Dogs. There are several skyscrapers located in Canary Wharf including the second tallest in the UK, One Canada Square. 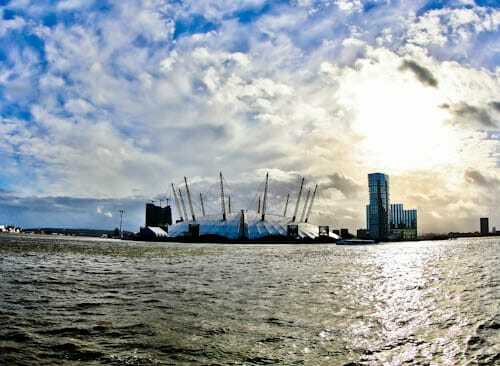 The O2 arena is the world’s busiest music arena. As a result it’s likely there’ll be a concert on when you visit. Prince famously had a residency here and Michael Jackson was scheduled to perform 30 shows here before he passed away. Check out the O2 Arena website for the latest events. 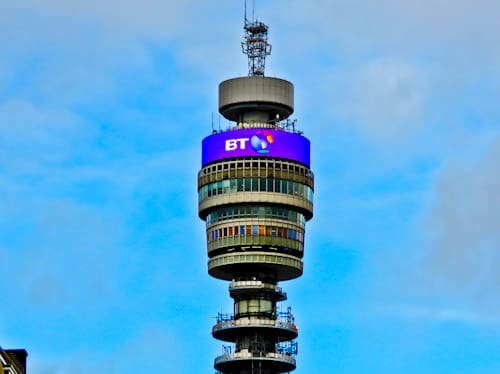 The BT Tower was built in the 60’s and once stood the tallest building in London. To this day however, it’s a working communications tower. If you fancy a romantic meal in London, there’s a revolving restaurant at the top of this London landmark. England is the home of football, therefore there are several stadiums in the capital. 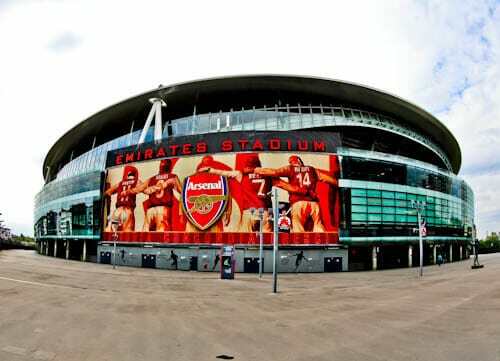 One of the most famous is the Emirates stadium, home of Arsenal FC. Read my experience on an Arsenal stadium and museum tour, a must for any Arsenal fan! 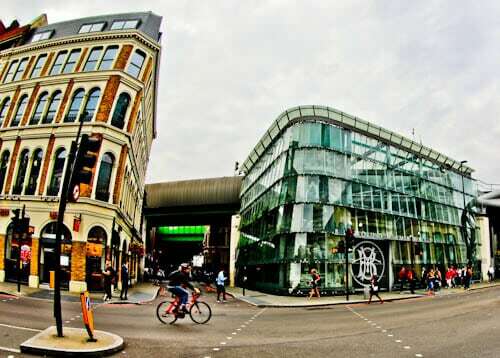 Borough Market is the most famous food and drink market in London. If that’s not enough reason to visit, how about the fact it’s a Harry Potter filming location? 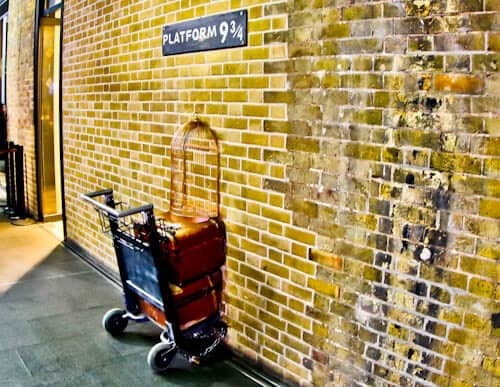 Does Platform 9 3/4 really exist? Take a look at my original photo! I took this at Kings Cross station, in between platforms 9 and 10! Of course, there is a huge line to get your photograph taken here! 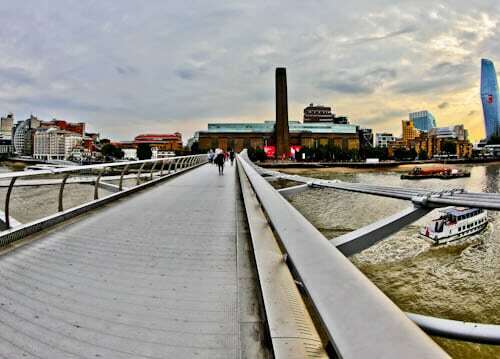 The Tate Modern is arguably the most famous museum in London but did you know about the Millenium Bridge in front of it? If you didn’t satisfy your art museum needs at the Tate Modern, you may want to visit the Tate Britain. 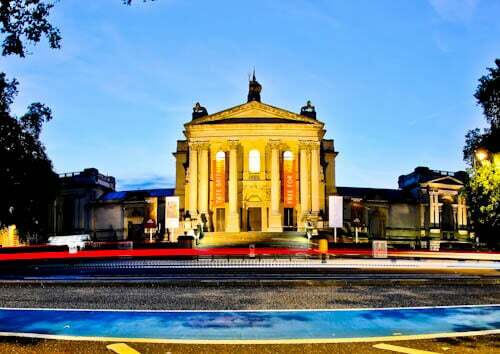 The Tate Britain is also located on the banks of the River Thames. If you travel to Liverpool, you may also want to experience the Tate Liverpool! 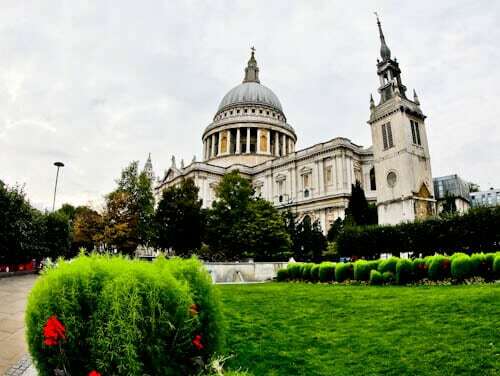 St Paul’s Cathedral is the largest cathedral in London and the 21st largest in the world. An interesting fact is that its architect, Sir Christopher Wren was the first to be buried in the cathedral. Another interesting fact is that it’s another Harry Potter filming location. London famously held the Olympics for the third time in 2012. 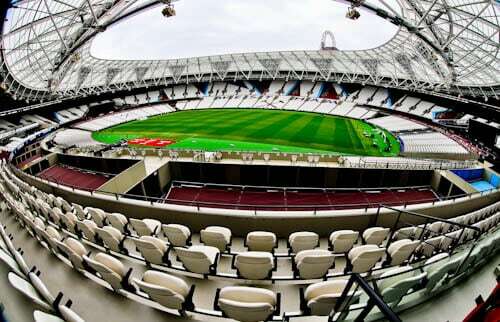 It possible to take a London Olympic Stadium tour and relive the excitement of those Olympics. Furthermore, you can visit the whole Olympic visit which has the highest slide in the world. These are rather new London landmarks, the Walkie Talkie and the Gherkin. Simply put, these are skyscrapers which resemble a walkie talkie and a gherkin! 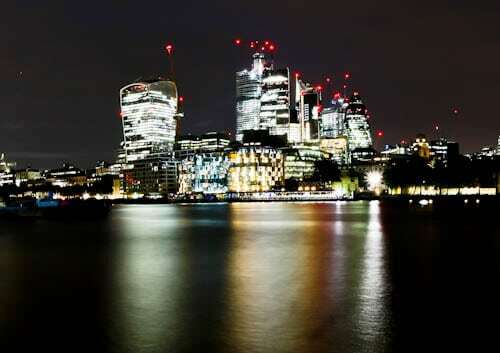 How about photographing them with a reflection in the river Thames? I’ve talked about Harry Potter filming locations, now it’s time to mention James Bond. The MI6 headquarters were famously blown up in Skyfall. Thankfully, that was just a movie and you can admire this unique building in its original state today. 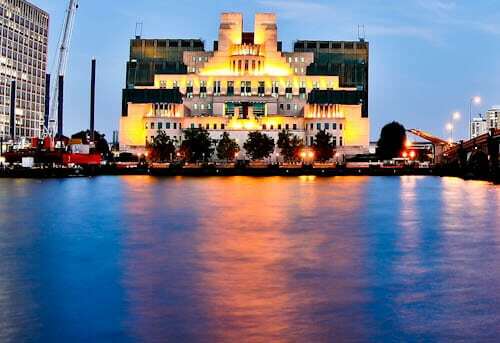 As a matter of fact, the MI6 headquarters featured in James Bond are the real MI6 headquarters in real life. 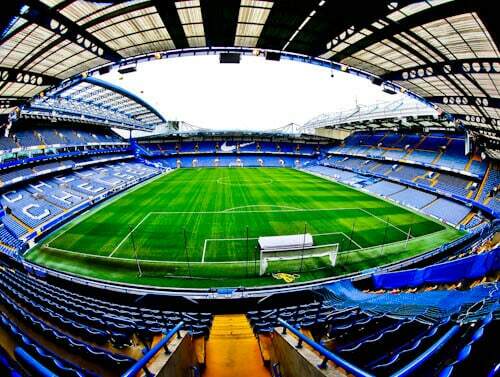 Stamford Bridge is home of Chelsea FC, for this reason it’s an important London landmarks. Even more so for Chelsea FC fans from around the world. 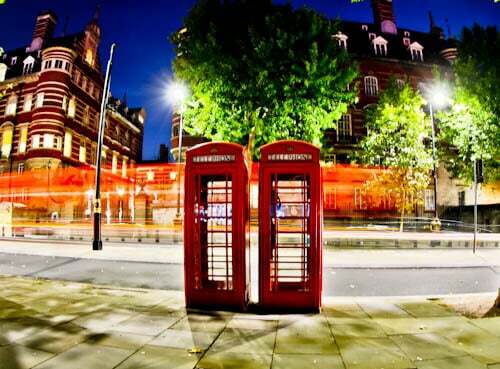 Red phone boxes are located all over the UK. In fact I’ve even seen one in Aruba, Caribbean. Unfortunately, many people who visit Britain only visit London so this is their only chance to get that Instagram shot in a phone booth. Thankfully, there’re located on almost every street corner of London. It’s likely they will be empty as most people use cell phones nowadays. One of the newest additions to the list of London landmarks is the US Embassy. This made headlines when president Trump refused to officially open it because of potential protests against him in London. Another famous football team located in London is Millwall FC. Actually, Millwall are an infamous team and closely linked to the football hooligan era of the 80’s. However, Millwall have a large fan base and it’s possible to take a Millwall stadium tour. 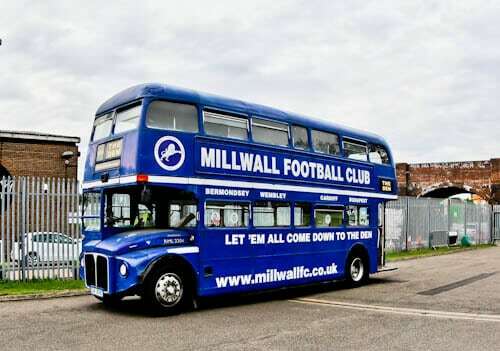 Interestingly, there’s a blue double decker bus parked outside the Den stadium. Red double decker buses are everywhere in London. If you’re photographing a London landmark, a red double decker bus will definitely enhance your picture. In addition, nowadays, in the era of advertising you may see different colored buses. 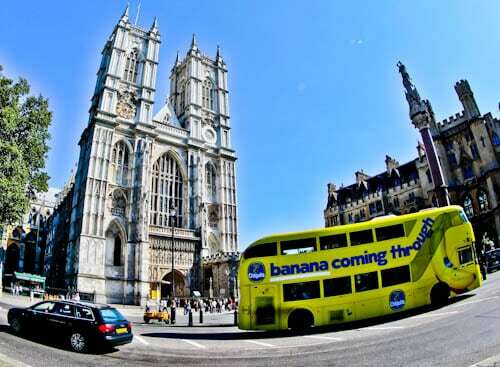 I even saw a yellow double decker bus sponsored by a banana company. The most famous music group in the world, The Beatles are from Liverpool, England. 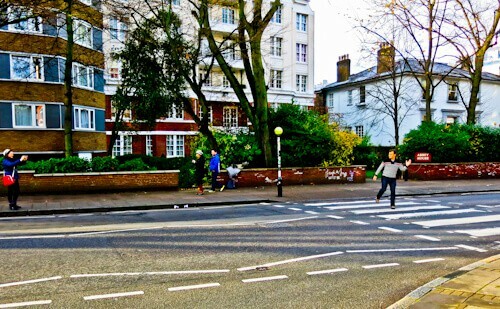 They made an album in 1969 called Abbey Road and on the front cover of the album they are crossing the street on this zebra crossing over Abbey Road. To this day, fans from all over the world visit Abbey Road to recreate the album cover made almost 50 years ago. I’m not sure what’s more entertaining, watching the tourists recreate the album cover or watching the car drivers getting frustrated at the road being blocked. Stonehenge is a 2 hour drive from London. You can easily visit Stonehenge on a half day tour from London, you could even combine it with a Windsor Castle tour. I chose to visit in the afternoon so I could catch the sunset (above) which was definitely worth it. The tours leave from the Victoria coach station in central London. 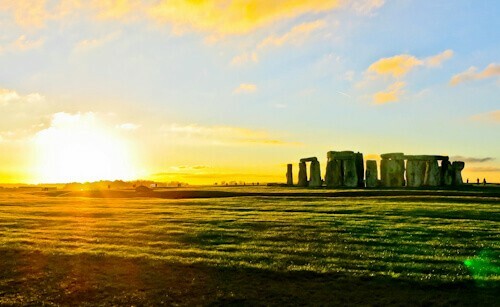 Stonehenge is one of the seven wonders of the medieval world and a UNESCO world heritage site, for this reason alone you should try make this trip. From London I took a Eurolines bus from Victoria bus station. The bus went all the way to Berlin but stopped in a few cities on the way in France, Belgium and of course, Germany. The bus passed through the famous channel tunnel between England and France. It was around 14 hours to Hanover and although the bus was not very comfortable it was significantly cheaper than taking the train. London is my favourite city! You have given some fantastic tips for all types of traveller – thank you! I love London, we always make special trips to visit the city! Thanks for sharing some great tips! I would love your post even more if you would pin all of your stops on the map! I would love to visit London someday! Your photos are beautiful and I love your descriptions and tips about each location along the way. 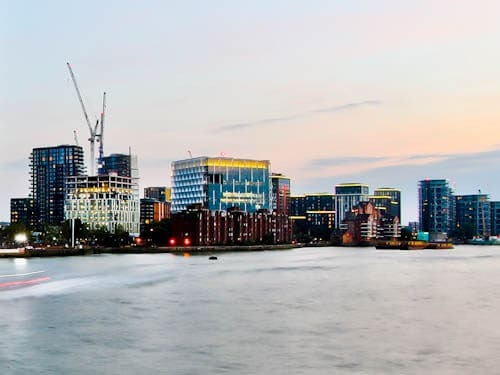 Your description about London city was really nice.The travel tips are very helpful for those planning a short trip to this beautiful city. Very informative article. Great ideas! I’m planning on visiting London for the first time this summer, I can’t wait. London is my favourite city! 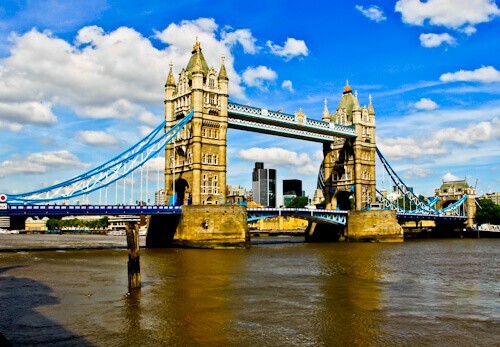 You have given some good tips for us.The setback about London is that it is expensive!But the scenery and the historical places are really amazing. So many great attractions in London! Personally, even though Stonehenge is a bit of drive, I would really love to see it in person! London is such a great city With so much to see. You have certainly listed the most important and interesting sights here. Great article. But UK is still part of the EU, right? The Brexit process has started, but UK has no left yet. Yes, I’m jumping the gun a little! I have a soft spot for the UK because I lived there for four years as a student. London is also one of my favorite cities. I especially liked walking along the Thames and checking out the markets like Borough, Camden, Spitalfields and Notting Hill markets. I like that London has these beautiful tourist destinations that you can enjoy for free. You should have featured cheap eats in London too. It would be nice to know what you can eat on a budget while exploring these places. I’d go for a meal deal at Tesco or Sainsbury’s express! I lived in London for almost 6 months but came back to Portugal (although I loved the parks, I couldn’t stand the winter with sunsets at 3 PM!). Walking by the river from the Millennial Bridge to the Tower Bridge is also a great way to get to know the city with lots of photo ops along the way. I’ve never been to the London Eye, though. I’m sure it’s an amazing spot to see the city, but I find it a bit overpriced. As for Stonehenge, I was expecting it to be overrated but I was pleasantly surprised (the trick is to go really early in the morning when the crowds are smaller). I was just checking price tickets to London from New Delhi, India (My country). The ticket prices are tempting and I might just be there soon. I am saving your blog for my visit. Hanover is on my mind as well. Ha ha! London it is!!! For shopping do include Camden as well! Btw, I see that the UNESCO bug has caught you too! Lolz. I went to Stonehenge by train – that was the first day trip out of London that I did when I was there. This is a great overview of London. I visited for a week a few years ago and got to most of these places – I think Stonehenge and Westminster Abbey were among my favorite things to do. 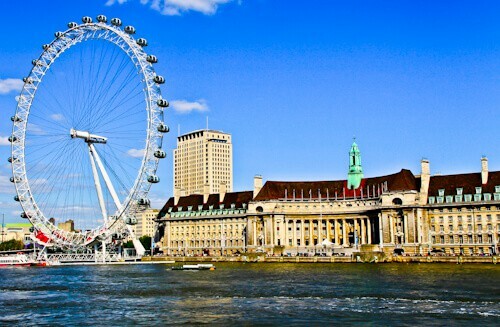 Did you ride the London Eye while you were there? I did ride the London Eye on a previous trip, on a clear day the views are well worth the effort of organizing the ticket up there. Oh I had no idea that there were so many hotels in London. It still surprised me! 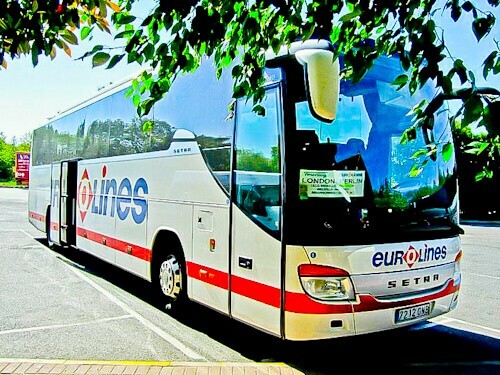 I love how affordable bus travel can be in Europe. Especially when you book slightly in advance. Believe it or not I’ve never actually done the proper tourist thing in London! Aside from Buckingham Palace (only because I ran the Bupa 10k one year which starts & finishes at Green Park!) and the museum with the dinosaurs (Natural/National History Museum???) I’ve never really been to any of the main tourist attractions! Bit hypocritical really because I still recommend them all to international friends, and go on and on about how much I dislike London. Maybe I should give it a proper go one day! i missed Stonehenge last time and I do not know it is so close to London, and the sunset picture is really beautiful. Wish I could be back to visit! A great summary of places to see in London. I always love seeing how other people perceive my home town. Never been to London but would love to some day for the amazing attractions and English football. Nice write p mate and hopefully I can get there soon. I totally agree that the London Eye is too expensive; but if you go at a good time, ie summer sunset, you can catch some great colours in the sky. I also think the tomb in the Abbey is interesting; there’s so much history to see. Still haven’t seen Stonehenge! Ah well, one day…! I had no idea there really was a platform 9 3/4. I’m heading to Kings Cross!